These days, many people describe themselves as "spiritual but not religious"— as spiritual seekers who are ANTI--religion, who like Jesus but hate His Church. 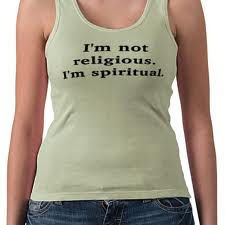 Next time someone says to you, “I am spiritual but not religious,” let them know -- as the Catholic Jedi that you are -- that they are speaking an oxymoron, a statement that is self-contradictory:* Like “Agree to disagree" or "A little pregnant" or "Boneless ribs” or "Sinfully good." 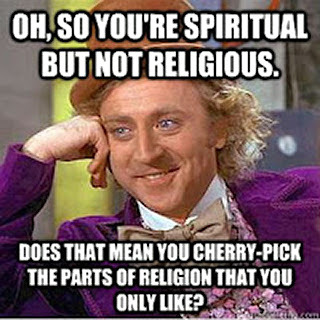 * Or “I am spiritual but not religious.”You cannot be “spiritual” without being religious. Thanks, Kathleen, but your comment actually demonstrates what was posited in the original post. You write, "My God, the higher power that I believe in, could not care less about petty and destructive, man-made religions." How do you know? Did your God tell you this? Are you sure it was God telling you this, or the Evil One? Because the One, True God made it quite clear, many thousands of years ago, that -- yes -- He does care about religion. Religion is a system of faith and worship (worship being the actions or rites that make up human beings' formal expression of reverence for God). True spirituality involves faith in the One, True God and worship of the One, True God. Kathleen, I sincerely hope that you realize that what you wrote is not WJWD. You wrote, "My kindness toward and compassion for my fellow man is my spirituality." However, the tone of your comment was quite angry and contained quite a few ad hominem attacks. This does not seem to demonstrate any good fruits from being a "wonderful spiritual being" and "spiritual but not religious" and filled with "kindness toward and compassion for your fellow man." Who are those "blessings" coming from? You? God? Your God? Or are you God? One's spiritual life, one's spirituality, is one's basic, practical, habitual attitude toward God and toward one's fellow human beings. Follow a false god or a non-existent version of the True God, and your spirituality will be misleading and ultimately narcissistic -- because it will not be based on the truth. One's spiritual life results from how one understands and live outs one's religious faith in the One, True God of Life. The Catholic Jedi Academy does not exist to be a cyber-battlefield for posting salvos of resentment, anger, ignorance, or venom. We teach. We propose. And as Catholics, our propositions and teachings are based in the Catholic Religion. It may not be your thing, but please at least give it a chance and use your intellect to seriously ponder what we publish on this blog. There is no need to be afraid of the truth. But, if upon serious consideration, you do not agree, we bid you adieu, but please, don't toss an angry grenade as a farewell gesture. It is not WJWD. Our God is the Way, Truth and Life. May your journey to him not be filled with difficult obstacles. I have excerpted below a few paragraphs from an article by Rabbi David Wolpe of The Sinai Temple in Los Angeles, and the author of seven books. Rabbi Wolpe's insightful observations are applicable to the affiliation of "spiritual but not religious" and to the behaviors produced by embracing that mentality. To be spiritual but not religious confines your devotional life to feeling good. If we have learned one thing about human nature, however, it is that people’s internal sense of goodness does not always match their behavior. To know whether your actions are good, a window is a more effective tool than a mirror. Ask others. Be part of a community. In short, join. Being religious ... [means] testing yourself in the arena of others. No one expects those without faith to obligate themselves to a religious community. But for one who has an intuition of something greater than ourselves to hold that this is a purely personal truth, that it demands no communal searching and struggle, no organization to realize its potential in this world, straddles the line between narcissistic and solipsistic. If the spirit moves you to goodness, that is wonderful. For too many, though, spirituality is a VIP card allowing them to breeze past all those wretched souls waiting in line or doing the work. Join in; together is harder, but together is better.